There are two main obstacles we face when we first start drumming. The first is getting the hang of the coordination and the second is understanding the rhythm. The lessons below are going to help with both of these. 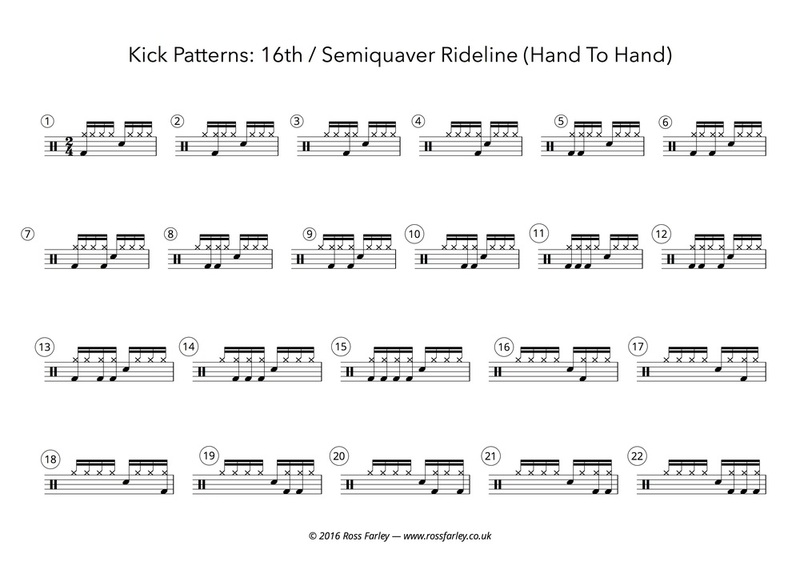 Each lesson features 22 kick (bass drum) patterns in combination with a constant hi-hat pattern. Once you can play all of these you'll have a good feeling for the main rhythms used in western music and have a strong grasp of the coordination required to play the drum kit. Here is how I recommend you approach learning and practicing this material. Before you start playing, set your metronome and try to “sing” the kick and snare pattern you are going to try to play. By sing, I don't mean some operatic masterpiece, just something that sounds like the drums you are trying to represent — dum dum, gah, dum dum, gah — etc! Once you have an idea of how the beat should sound try to play it. If you can hear how the beat should sound in your head you are going to find playing it much easier. Play through the exercise until it feels comfortable and you can play it from memory, then move on to the next one. Try not to keep your eyes glued to the music, you'll remember the patterns better if you practice playing them from memory. The next step, once you can play all 22 patterns, is to try pairing them up to make longer grooves. One way of doing this is by writing the numbers 1 to 22 on a piece of paper and then crossing off the pairs of beats as you go. If you struggle with any groove, just stop and practice the patterns individually before combining them. Next, have some fun with them. Try adding fills or pairing up the pairs you have worked on in a verse/ chorus structure. For example, 1&17 for four bars, 6&16 for four bars and repeat. A note for those new to reading music. There are four possible positions for the bass drum in each beat, 1 e + a, and only two beats in each bar, 1 e + a 2 e + a (the snare is on beat 2). Start with the “16th Rideline” lesson. In those exercises the hi-hat is on every 16th note (the 1 e + a 2 e + a) so each bass drum will be played with a hi-hat. You can move on to the other lessons once you've got the hang of that.